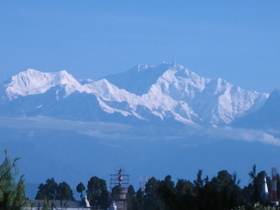 The easiest way to get to Darjeeling is to fly into Bagdogra airport in North Bengal. There are daily direct flights from Kolkata and Delhi, but none from Mumbai. I landed in Bagdogra with my high school buddy on a steamy Saturday afternoon after a short flight from Kolkata. The S.P. had sent his private jeep to pick us up at Bagdogra and we were soon on our way to Darjeeling. The drive from the plains to Darjeeling is about 95 kms and we climbed 6,500 feet up the mountain roads. It took us about 3 hours including a half hour hour pit stop for tea and momos on the way. The celsius began to drop within 20 minutes of our climb and the flaura and fauna took on an alpine look. As we drove through winding mountain roads, I could see the plains rapidly receding away below along with its heat and dust and chaos. The sky was an azure blue and the mountain air was fresh and cool. For the first time since I had arrived in Mumbai, I began to feel a sense of peace and calm come over me. The ride was uneventful and we reached Darjeeling early evening. The S.P. 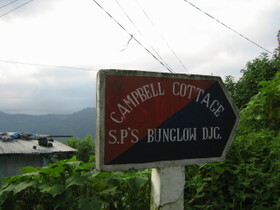 's office is in a beautiful old Colonial cottage overlooking the valley below. It was good to see my old friend after all these years. Despite his years in the police, he had certainly not lost his sense of humor and wore his authority well. We drove to his house and caught up with each other on the last 15 years over some scotch and pakoras. I was tired and turned in early that night. I woke up unusually early on my first morning in Darjeeling, just before sunrise. I stepped out into the lawn and took a deep breath of the cool morning air. The S.P. 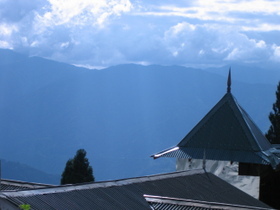 's cottage is set on the top of a hill with a spectacular view of the Darjeeling valley on all sides of the house. I sat down with a cup of tea on the lawn to savor the freshness of my surroundings. I conciously blocked the flurry of thoughts that usually flood my mind when I wake up each morning and emptied my mind of its preoccupations, feeling nature with all my senses. It was a good start to a much needed vacation.